Here is an opportunity to make your contribution to BITS forever etched in its legacy. The Naming Rights Policy encourages you to reward you with name facilities, equipments, endowment in multiple avenues, acknowledging your significant philanthropy. The following illustration provides an overall summary of the policy. For a more detailed version, please click here. To know more about Naming Rights Policy, please reach out to Prof. Arya Kumar at deanalumnirelation@pilani.bits-pilani.ac.in or Mr. Sachin Arya at sachin.arya@pilani.bits-pilani.ac,in We would be happy to clairfy your queries. All donations to Birla Institute of Technology & Science Pilani qualify for 100% deduction u/s 80G(2)(a)(iiif) of Income Tax Act, 1961. BITS Pilani now has an official alumni community on AlmaConnect – an exclusive space for all BITS alumni to come together, share, relive memories and help each other move ahead. If you have not made your profile yet, please click the link to create your profile and get started. Every year, BITS Pilani feels proud to celebrate and felicitate its alumni who have made significant contributions in their field of operations. Constituted in 2011. BITS Alumni Association (BITSAA) International is a not-for-profit organization incorporated in New Jersey whose principal aim is to strengthen the ties, friendship and communication amongst students, alumni, faculty and friends of the Institute. It provides a number of channels for people to stay connected with each other and with Birla Institute of Technology & Science. BITSAA International also engages in charitable and educational activities by raising funds for setting up endowments, creating scholarships,rewarding teaching and research and generally promoting the development of resources at Birla Institute of Technology and Science at Pilani, Dubai, Goa & Hyderabad campuses.BITSAA International has over 18,000 BITS Alumni worldwide as its members. Membership is free. Please visit the BITSAA International website for membership registration and details of activities. The Student Alumni Relations Cell is pleased to launch the Graduating Class of 2019 Giving Fund Campaign. Here is an opportunity for 2019 batch to give back to their alma mater. 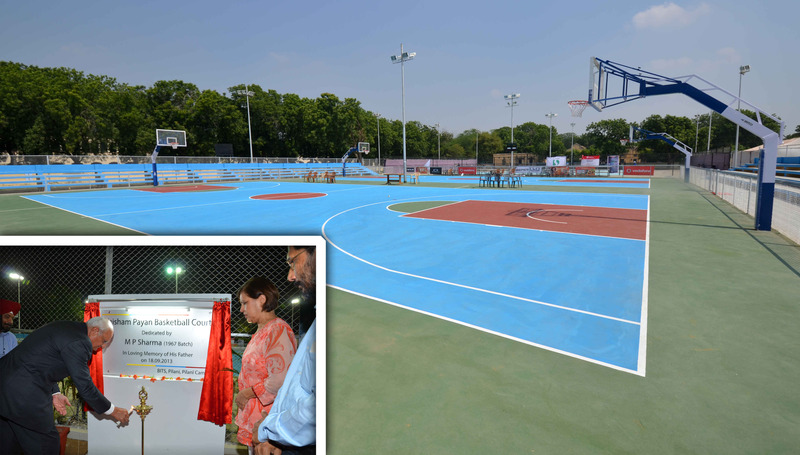 New basket ball courts gifted by Mr M P Sharma of 1967 batch.